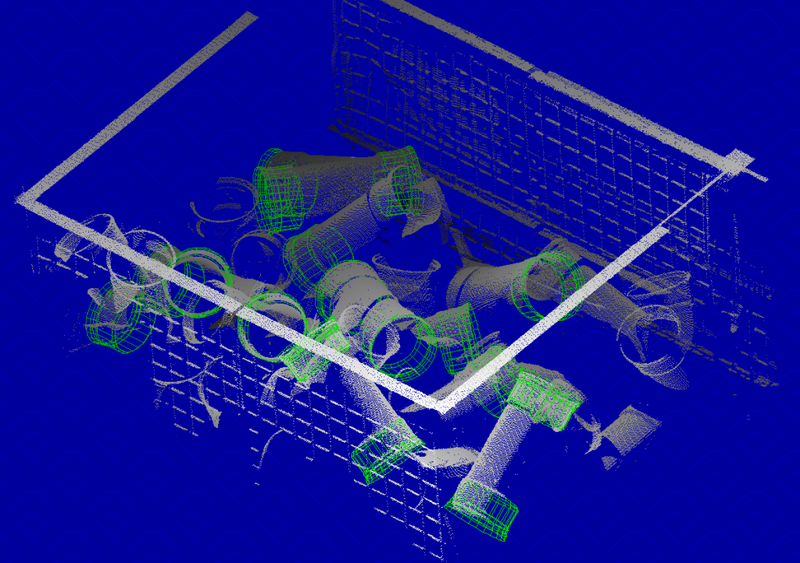 Integrator Robomotive rewarded Beltech with the order to develop a 3D random bin picking system. The solution is capable of handling a multitude of randomly placed products in an automated and industrial way. The objective to let multiple robots work together 24/7 has succeeded. Robots now safely perform the dull and sometimes dangerous work by handling these products instead of human operators. In close co-operation with Robomotive, who took care of all control, mechanical and robot programming work, the below random bin picking system was realized. After having tested existing software algorithms such as OpenCV and Halcon it became clear that given the required robustness, speed and accuracy a dedicated algorithm needed to be developed. To meet the cycle times an optical and software solution was designed that scan one half of the crate and then stitch the two 3D clouds that are derived from the vision scans. This required a compelling calibration solution. By applying multiple lasers under an angle the impact of occlusion was minimalized. In the movies below you can see the actual set-up working in the factory.